Just had the first burn after dashboard message was activated at the dealership. Message comes up, burn took about 15 minutes to complete (much, much quicker than before ECM update) and exhaust temperature was spiking to 715 Celsius towards the end of the burn (once the DPF level started dropping below 20%). Mainly temperature stayed between 650 and 700 degrees. Will post image of a display message later. Last edited by grunf on Fri, 08 Feb 2019 7:13 +0000, edited 1 time in total. grunf wrote: Had the switch installed today. Manual switch will only work if the DPF gets full and DPF light or a message (depending on a hilux model) is displayed on the dashboard. You can't manually start DPF burn just for the sake of it. This seems useless to most people, particularly those requesting a manual button due to driving in paddocks/bush tracks. I run a scan gauge and have used this once to do a manual burn before driving through paddocks when I knew a burn would have otherwise automatically occurred. I was thinking a manual button would just make this easier however it doesn’t appear to be the case. It would be handy if the manual button worked so you could hit it when you are on a good stretch of highway knowing you will be turning off into paddocks or the bush rather than having to stop and wait while it does it’s thing. Agree, button is useless. Having the ability to pause a burn in dangerous conditions would make better sense. I think it's an appropriate implementation consistent with the update model. There are a lot of people out there outside of the few more serious and switched on types who frequent this forum that make up the bulk of the "car of the year" buyers. Mostly metro and habitual button pushers, Toyota would be rightfully concerned at the potential collateral damage as there are risks and downsides to every manual burn. The button is intended as a last ditch emergency option that will get you out of serious mechanical risk &/or show stopper situation if you reach a critical level in a difficult environment and particularly a long way out. My primary option is Scanguage and I have the burn command programmed into it for both discretionary & emergency. However it could fail, lost or stolen as it simply unplugs & off the Velcro, and it's even possible a future ECU update could invalidate the unofficial burn code I found. It's reassuring to know I have a plan B bailout option if things really go pear shaped. I'm curious, could you please elaborate on these "scenarios". Please educate me then. Im realy keen to hear your expert opinion. Or lets see if others think if I know how system works or not. grunf wrote: Please educate me then. Im realy keen to hear your expert opinion. The problem in the scenarios you described is frequent stops/lack of driving time. A manual burn button will not remedy that. The system still needs time to get up to temperature. Andyfive wrote: I'm curious, could you please elaborate on these "scenarios". Grunf is correct, and most of the important summary points should already be in your manual. 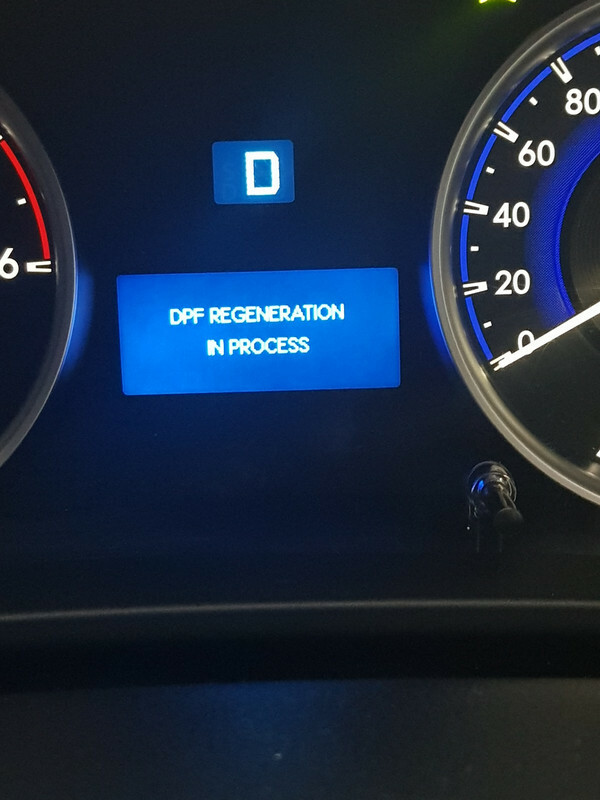 To put it simply if your speed and temperatures are not sufficient for automatic regeneration your DPF will eventually approach capacity and you will you will start getting warnings. The first stage essentially tells you to get a move on to enable automatic regen, or hit the switch and do a manual regeneration. If you can't and don't have a switch you will then get a second stage warning to hit the switch or go to a dealer. If you are remote from a dealer your now heading quickly into trouble. If you keep driving the DPF will completely max out and you will now hit stage 3 warning, vehicle goes into limp mode and tow to dealer. If you keep driving this is where the physical damage starts, and if you are climbing in steep country and/or towing you could need the power you now don't have and are in even deeper trouble because you could be getting to the point of being badly marooned. ggreenie wrote: A manual burn button will not remedy that. Incorrect, the button does exactly that. The manual regen process specifically increases RPM and raises DPF temperatures sufficiently to enable the burn. That's why the manual switch instructions state not to squat on flammable material or touch the exhaust while you are doing it. No, no, no. Wrong. It isn’t a blowtorch, it can’t instantly bring everything up to temperature. The burn cannot commence until the system is at operating temperature. Otherwise the fuel coming out of the 5th injector won’t ignite. ggreenie wrote: it can’t instantly bring everything up to temperature. Sorry incorrect again, nobody said "instantly". The manual regen process can take something like 20 mins to get up to temperature and complete the burn. The button starts the process. The button does literally nothing unless the whole system is already at operating temperature. so what is it that I don't know about how DPF system operates again mate? in cases when dpf light comes up, manual button will try to commence "force burn" if/when pushed, meaning car revs will increase in order to bring the temperatures up and burn will commence (exactly what is happening with Torquepro command or Scangauge as well ...), so the button WILL bring the temperatures up, as others are trying to explain to you as well, that is the whole point of the button. Last edited by grunf on Thu, 14 Feb 2019 7:14 +0000, edited 2 times in total. Bushwalker8 don't worry mate, you know the old saying: "You can lead horse to the water, but you can't make him drink"
ggreenie wrote: The button does literally nothing unless the whole system is already at operating temperature. Not sure what point you are trying to make here in the context of the discussion but it is misleading. The switch once armed by the fault condition can only be activated while the engine is running. The fault warning will also normally come on while driving (simple probability). So in most cases the system will be already at, or at least approaching sufficient temperature for the manual regeneration process to take over and increase it from there. In the event that temperatures may be lower than required by the manual process, either before initiating the burn with the switch or during regeneration, Toyota have provided simple and clear instructions in the manual to increase revs temporarily to assist raising the temperature.